Lettering isn't raised on mine but inset so i thought I'd fill with molly metal and paint with wrinkle finish, probably black but may go red!! The wrinkle finish will also carry over into areas of the c*ckpit, again not sure on colour as i want to use red leather (subject to cost) seats so could be either black or red. Thats a great thought regarding the cam cover letters. Good thinking. Loving the Replicar build threads. Hope to follow many more. Just time for a 'quick' job. In the absence of a hole cutter of the right size we opted for the only other option open to us. 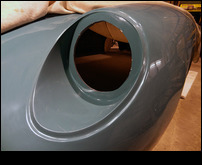 Actually, 20 mins each side had the headlight apertures drilled out and fettled. By offering up the headlight we could now address the side light issue. Our donor car had separate headlights in the bumpers. Obviously we don't want additional sidelights on the front of the finished car. 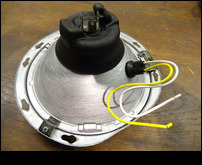 Once we had ascertained that there was enough clearance around the headlight assembly, we drilled a 14mm hole towards the top of the reflector and installed a 5 amp bulb and rubber holder (EBay £2.60 each) to both lamps. Now we just have to work out how to mount the headlight whilst still making it adjustable. Some home-made spring bolts seem the best option but then there is the problem of water ingress. The whole assembly will get soaked from the wheels on a wet day and we don't want the cowl full of dirty water. 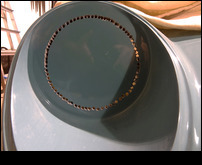 I think Larry's on to it - found a back cowl and screws on t'internet. Just checking size. Onward! Build stalls somewhat due to lack of front shocks (bl**dy internet vendors!). Meanwhile I have been completely engrossed in the rare, two-volume history "Racing with the David Brown Aston Martins" by John Wyer with Chris Nixon. 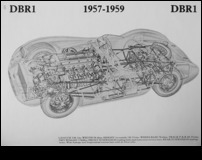 Just amazing, detailed recollections from the beginning with the 'Atom' (later to become DB1) through the DB2s, DB3Ss and finally the DBR1s and the winning of the Le Mans and the World Championships. Those guys were just so fabulous. Setting out from Feltham in a DB3S with a pair of goggles and a leather bag of clothes, driving to the Nurburgring, wiping the floor with everybody, a quick drink and drive back to the UK to race at Oulton Park or similar two days later. The schematic above is from the book. I like the battery position in the passenger sill. 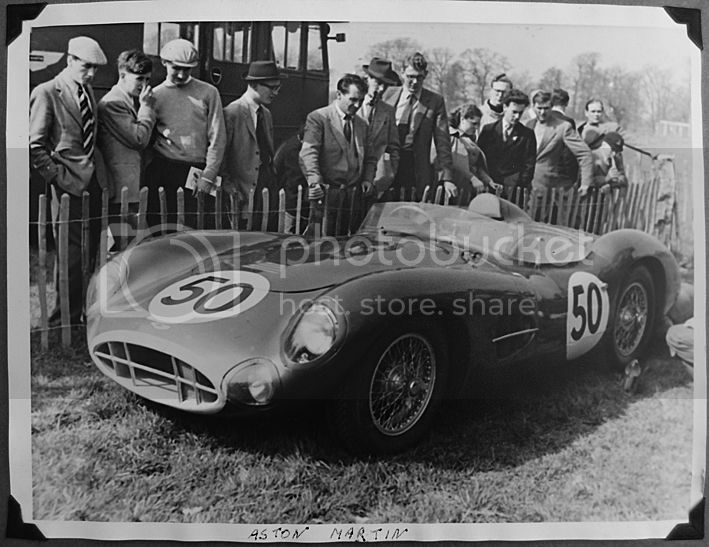 Thanks Graham Bracegirdle for the loan of your precious volumes and of your incredible photo album full of pics of the Astons and drivers you took back in the 50's. Thanks, too, to everyone who is reading this and giving us encouragement in our first build project. More soon. J. Nice pic! Good to see the original suspension systems. I saw the battery location on one of the originals but wasn't sure if it was a second battery. 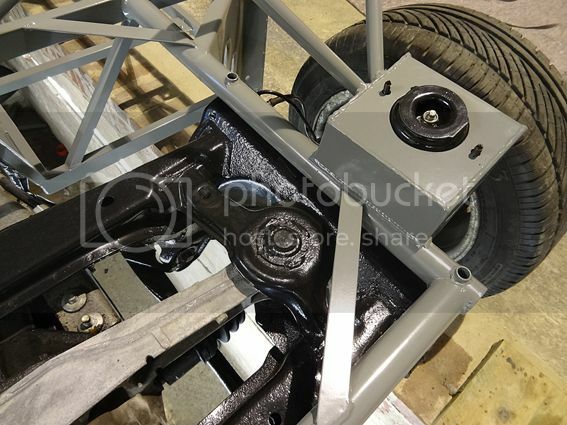 I'm thinking of a location on the Replicar behind the LH rear bulkhead in front of the suspension, a bit more weight to the rear. Great cut away picture, I notice spare sits over tank so my idea isn't that original after all. Assume location of battery helps, if only slightly, in balancing when only driver in car, like the idea but not an option if I route exhaust this way. James have you fixed the steering column at the bulkhead yet? I'd be really interested in how you located and fixed. Called in at the spray shop yesterday to obtain some colour chips and was redirected to the local auto paint suppliers. Didn't realise how many metallic greens there are that are close to all the pictures i've seen, pulled out about 20 and narrowed it down to five, would have uploaded the codes this morning but my wife has taken my car (the info is in the glove box) to work. Will upload tomorrow (although i acknowledge different computer screens/monitors will give different representation of colour). Continuing the colour theme i thought that rather than go smooth black for the MX5 subframes I'd go Hammerite Mid Green (chassis is powder coated grey), used this years ago in the wheel arches of all my cars (back in the days when i had time) and in addition to looking good it resisted all attacks from road salts and the various stones etc that get thrown up. Only problem is Mid Green no longer appears in the Hammerite range so have dropped them a line to see if it can be made available albeit in a relatively small quantity (anyone else out there interested?). Should say there is still a green in their colour range but is a dark green. Sorry everyone. I'm still trying to work out how to get the recent pics of DeBoRah up for you to see now that my attachment function isn't working. As soon as I do I'll try and get this blog back on track as a sequential record of the build. I think maybe someone should start a General Replicar Chat thread where we can all pool our growing combined knowledge. Any takers? Im not sure on the attachment function and I didnt expect that you would be able to attach anyway. Forums hosting pics is a poor use of resources. You are much better with off site hosting and you can then share across multiple forums/blogs if that floats your boat. Would love for you to persevere with getting pics up. Yell out if I can help. Bearing in mind i kind of feel I've hijacked your build thread I'll have a go at setting something up around the general sort of queries that may arise. 1. First open an account with www.photobucket.com, there is no charge. 2. Ensure you know the location of the photos on your PC, which you wish to post. 3. Upload the selected pictures from your PC to your newly opened 'photobucket' account. 4. This is quite straight forward, simply click on 'browse' in photobucket, locate and select the desired photo, double click it, then click 'submit' in photobucket. With a bit of luck a copy of your photo will now be uploaded to your photobucket account. 7. Click on the picture frame on the top of the "create post" page and delete "http://". Now right click and paste in to the box and left click "insert image". Ah haaah! We're back in action! Thanks everyone for your help with the forum. Sorry I got ratty. Thanks too to 'retired 2 soon' who's hoping to set up the Replicar general chat thread. 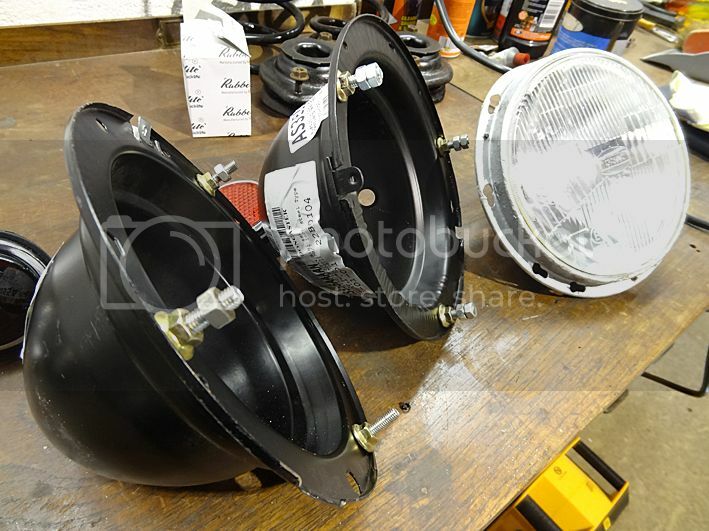 Right... Quick pic above just to show you two relatively cheap headlamp bowls that Larry found on the Interweb. Still fiddling with adjustable mounting bolts but should be OK. Bowls might be fixed permanently and sprayed in with the final body colour post-IVA. First time offering-up of the space frame. What a satisfying moment! I have to say the frame seems perfect. We expected it to fit, of course, but it was just feels good when all the bolt holes, shocks etc. line up and drop into place. Hats off to Stuart and an excellent jig! 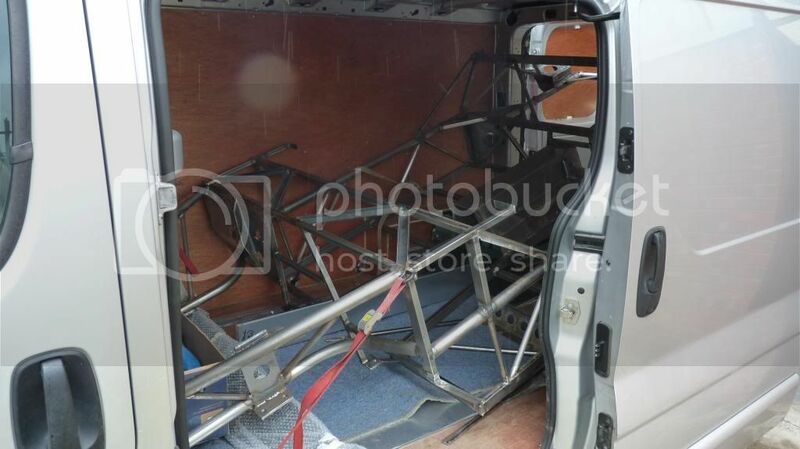 Excellent idea to have the frame in the grey and we continually celebrate the powder coating. Such a pleasure to handle and such good value. Front shocks still haven't turned up you'll notice. Looks like a 'Mad Max' vehicle or something military. Certainly feels like we're progressing. Frame whipped off and flipped for flooring. Stuart recommends a 75mm overhang on the 'sills' so some carefull measuring was called for to line up the cross members etc. - all very straightforward really. I drilled the rivets and Larry popped them in and we had it done in no time. So quickly, in fact, that we were nearly finished when we realised we'd forgotten to do something. 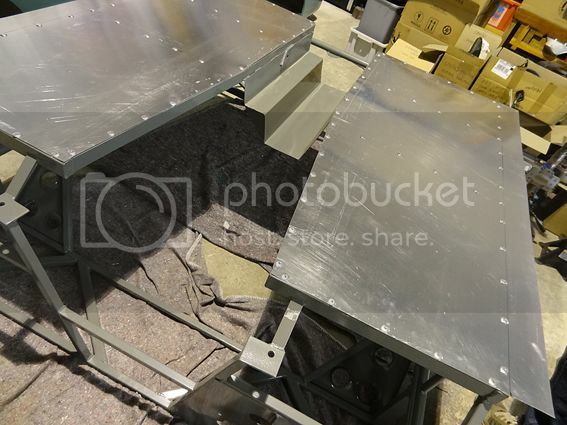 We had discussed applying a bead of silicone seal around all the frames before dropping the floor pan onto it and rivetting it down. Still a good idea I think. We kicked ourselves but weren't about to drill out all we had done so far. We'll come up with something because we don't like the idea of water being trapped between the alluminium and the steel frame. We used 100-120 mm centres on the rivets - probably overkill as it used about 100 in all. Still, why stop when you're having fun. 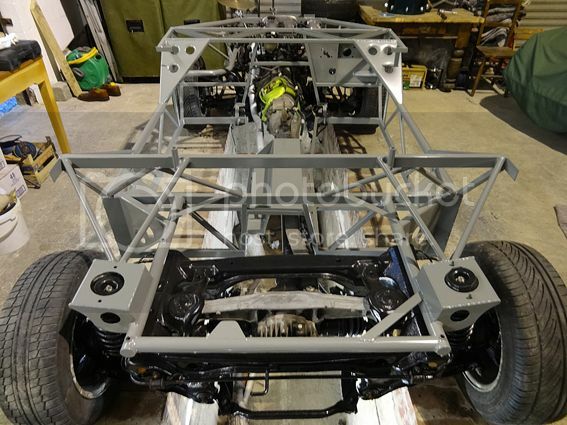 Here is a unique picture of one of the original five cars courtesy of Graham Bracegirdle. He and his brother have a large selection of photos from this period that they took as young men and developed in their bathroom at home. Notice louvres on bonnet, yellow 'mouth', gills in side vents and number illumination light for 24 hour racing on passenger door. Aston Martin racing bus in background. 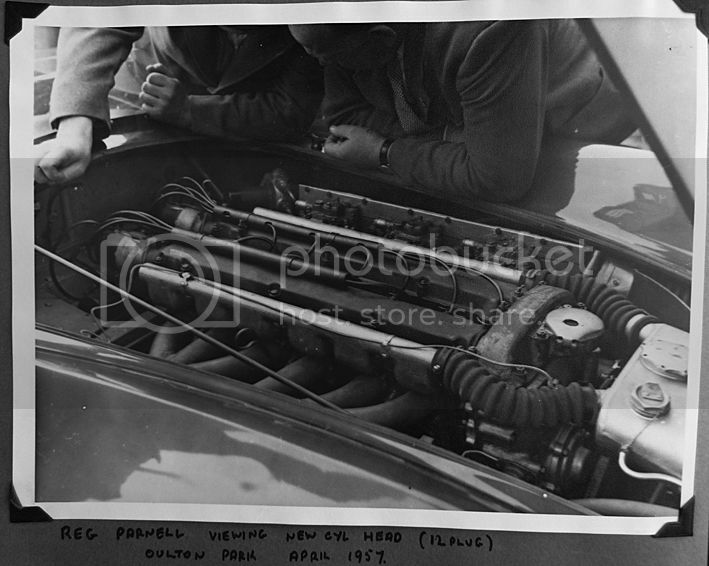 As the writing says, the legendery Aston driver Reg Parnell inspects the power plant. Thanks, Graham, on behalf of all who are watching this blog, for your generous permission to show these pics. Inspiring. Weekly session tomorrow night. Lets see what gets done!